Hello and welcome to my Blog. Its the first time I've done a Blog so please bear with me if its not as slick as I'd like. For those of you who don't know me my name is Stuart and I'm a National Road Racer. My first experience of road racing was in 1994 when I visited the Isle Of Man TT, shortly after passing my bike test. I remember watching the racing at Ramsey hairpin, when I had an epiphany, this is what I want to do. The sheer spectacle of those racing around the best road in the world at whatever speed you felt comforatble at still makes my hair stand on end, I was hooked. Upon my return from The Island I started looking into what I had to do to start racing. I spent the following months researching the best bike, leathers, clubs etc to get me started. After what seemed a lifetime of looking in MCN bikemart I found what I was looking for, a 1991 Kawasaki ZXR400. A visit to Bristol saw me as the new owner, you can't believe how excited I was. My first race was with North Gloucester Road Racing Club at Keevil Airfield in 1995. I spent the next 3 years racing at various circuits around the UK, which culminated in a very wet race in late 1997 at Silverstone when I got the final signature I required to gain my National licence, which qualified me to go Road Racing. I'd enjoyed my time racing at short circuits but it was the roads that drew me, and so in 1998 I entered my first road race, The Manx Grand Prix. On the entry form they ask what are your ambitions you have for the races, all I wanted to do was qualify and finish. However after the first practice session I was second quickest in my class, so my ambitions grew slightly. At the end of practice week I was second overall, so hoped I could keep that through the race. Sadly it was not meant to be and due to a mechanical problem, my very ornate catch tank worked loose, I finished in 5th. This did still earn me a silver replica, which before the week I would never have dreamt of. In 1999 I returned with my 400 and a GSXR600. I was never comfortable with the 600 and after the race I found out that the front end was damaged due to an accident in a shake down race before the Manx. The 400 never missed a beat and I finished 13th in the Ultralight weight Race. 2000 was a year I will never forget. I only took the 400 over that year and and set my goal at 100mph average lap. Race day was postponed due to bad weather, so racing started on Saturday 2nd September. Sadly the next I remember is waking up in Nobles Hospital 5 days later, after an off at Black Dub, which resulted in a very badly fractured skull. I crashed on the second lap and was delighted to see that on my first lap, from a standing start, I had achieved my goal and did a lap of over 100mph. I was off work for 5 months but never considered giving up racing. It is true to say that its a real wake up call when even the Doctor who put me in the helicopter just shook his head when he saw my injuries, and believe me these guys are used to seeing severe trauma. So I did take time off to do other things as you never know when your time will come as you don't get a tap on the shoulder saying this is it my friend. I did some great trips and tried new hobbies but never lost my passion for road racing. I did a couple of short circuit races to keep my licence at National level and in 2008 the draw of road racing became too much so I entered The Southern 100. This is an excellent meeting and my love was rekindled. So much so that as soon as I returned home I looked to see what other road races were left for that year. Killalane was being run in September so entries were booked and I was to take part in my first Irish Road Race. Due to the cost involved in getting to Ireland I decided to get a second bike, having sold the GSXR, so in late 2008 I bought a Kawasaki ZX6R. 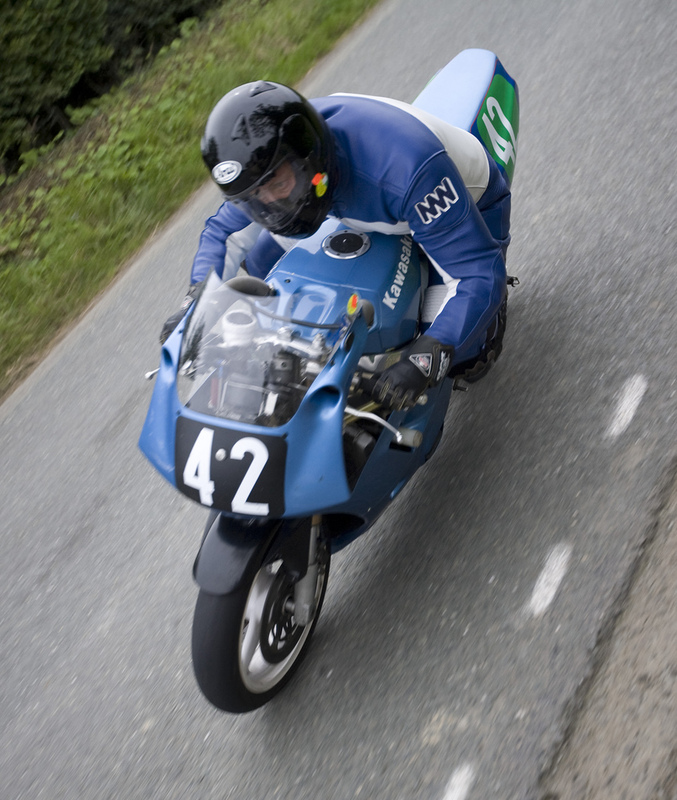 I raced at the post TT races at Billown in 2009 and was back again for The Southern 100 in July. Sadly it wasn't until 2012 that I manged to go racing again, so my first race was at Southern 100. Before first practice I was a bundle of nerves, but these were soon dismissed and after the session I realised why I love the sport so much. So much so that before I'd left I was booked in for Aberdare and also Killalane. Aberdare is a great circuit and is a well run meeting and hope to race there again. Killalane is also a great race and holds a special place in my heart as it was my first Irish race. I know Isle Of Man is capital of road racing, but Ireland is where road racing lives and breathes, with racing on an almost weekly basis. Everyone who is involved is so helpful and I look forward to racing there as much as I can. Which brings me to 2013. I've always dreamt of doing as many rounds of Irish National Road Racing Championship as I can, so this year I hope to live that dream. I'm hoping to do 8 out of the 11 rounds of the championship as well as Southern 100 and possibly Scarborough, so its going to be a busy year. Funds allowing I would like to do more, but this will depend on how the season pans out. If you are at any of the above races then please feel free to pop along and say hello, I can talk the hind leg off a donkey where bikes are concerned. I'll be racing 142 on both the 400 and 600. Thanks for reading and I hope to keep the updates coming. Interesting read and all the very best for a successful safe year of on the roads racing. Do you remember me speaking to you over the wall at the 2008 Southern 100 meeting? Wish we could be at the meetings also,but at least we will be able to follow the 142 travels on the blog. Good luck Stu I will be cheering you on and full of admiration for you. Keep it on the grey stuff and hope to catch up with you sometime. Stuey. A very inspiring narrative and you are doing what alot of us just dream of. Best of luck for 2013 and don't forget to buy your pit crew lots of beer.